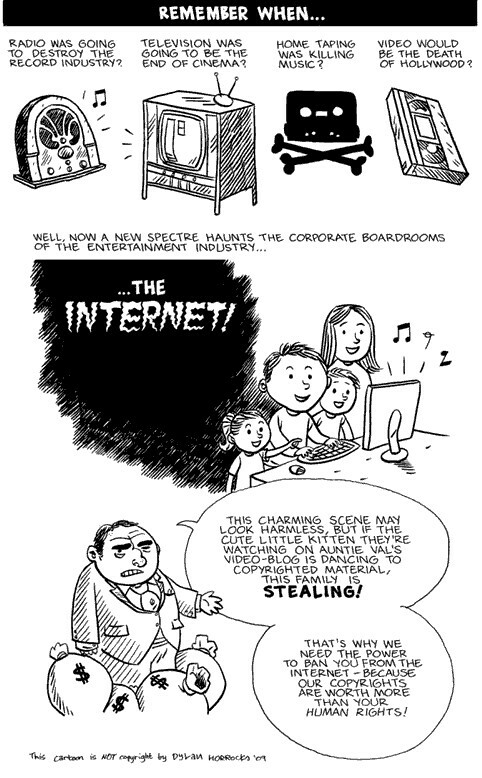 Fascinating little cartoon from The Pirate Bay. And, while simplistic, it certainly speaks volumes to the recurring trend in history of copyright issues and emerging technologies. I just finished a great article in a Step Inside Design that talked about copyright infringement with stock photography and another one that referenced Shepard Fairey’s use of an AP-owned photo for his iconic Obama campaign poster. I also think it funny that every time I record a House MD on Fox when I’m away from home for Optimum Tuesday’s free movie night, I’m apparently breaking the law.